On July 18th two hundred years ago, at a house in Winchester, Jane Austen died at the relatively young age of 41. She had laid down her pen twelve chapters into her final novel (The Brothers, later published as Sanditon) in March of 1817, due to her worsening health, and it would remain unfinished. Her six major novels, however – Sense and Sensibility, Pride and Prejudice, Mansfield Park, Emma, Northanger Abbey, and Persuasion – would become her legacy to the world, and would secure her reputation as one of the most cherished novelists ever to write in the English language. 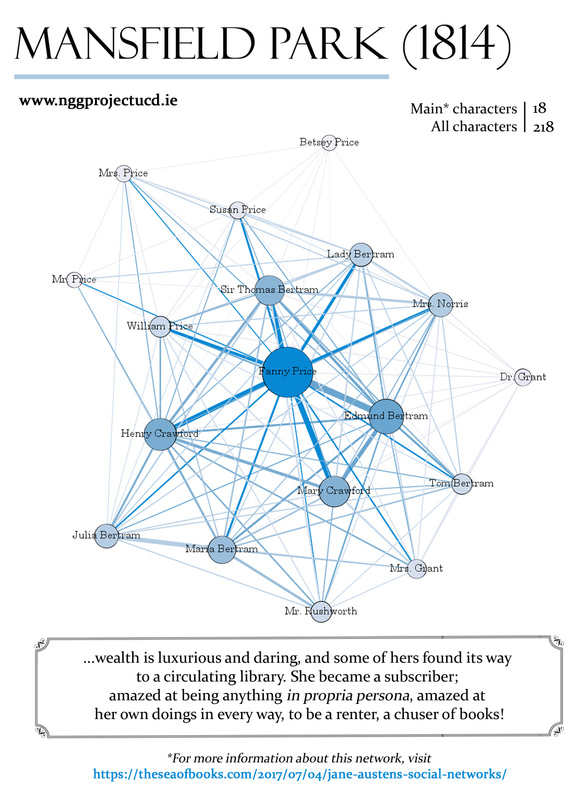 As a celebration of the life and works of Jane Austen, we’ve put together a set of posters showing social networks for each of her major novels. 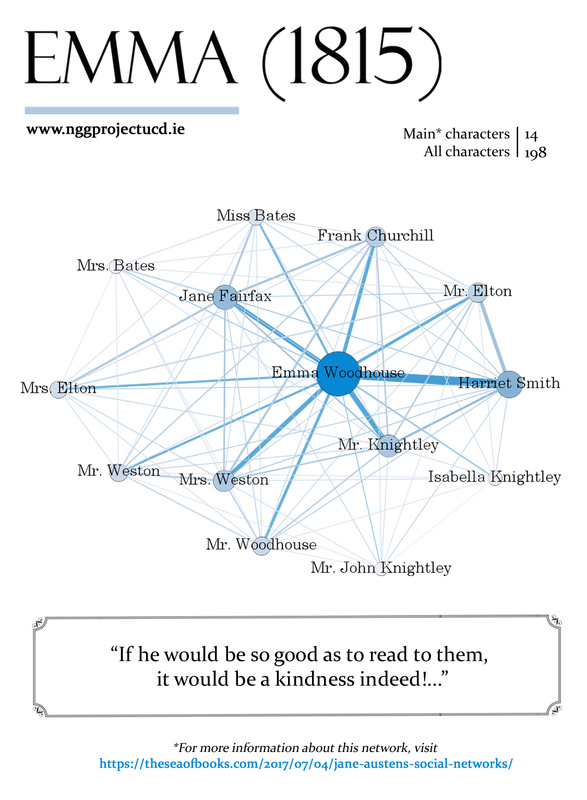 This work was conducted as part of the Nation, Genre and Gender Project, in order to examine the societies and social relations that appear in a set of British and Irish novels published between 1800 and 1922. Although our overall project focuses upon a very wide range of works in a number of different genres, by both well-known and obscure authors, we have found ourselves returning again and again to Jane Austen’s novels. With their minutely detailed observations of individuals, and their sharp and often hilarious dialogue, there is always something more to discover in her portraits of early 19th-century social life. You can find a high-resolution version of this image here. For a higher-resolution version of this image, click here. Some answers to some questions you might have! Glad you asked! At the most basic level, these networks are based upon co-occurrences between characters in the novel. 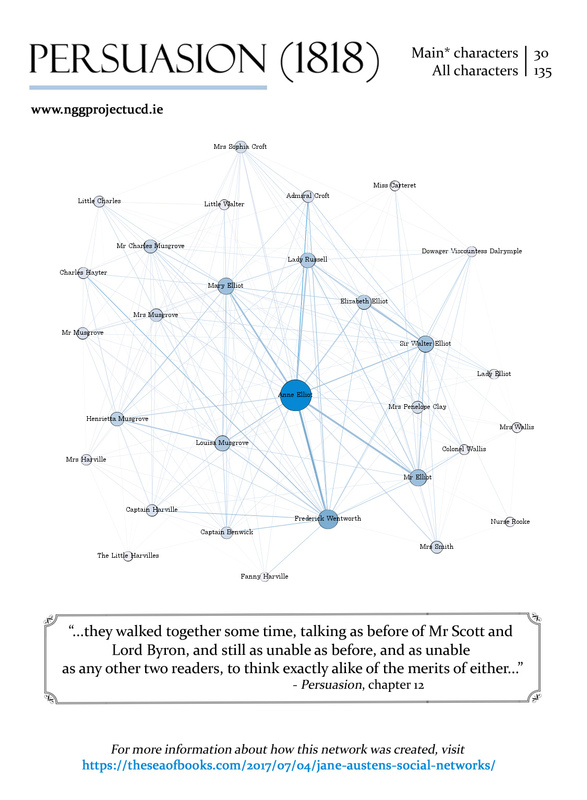 Every time two characters appear within a certain textual distance of one another, we understand this as representing a connection between them in the novel. The network is a visual representation of all of these links between characters. 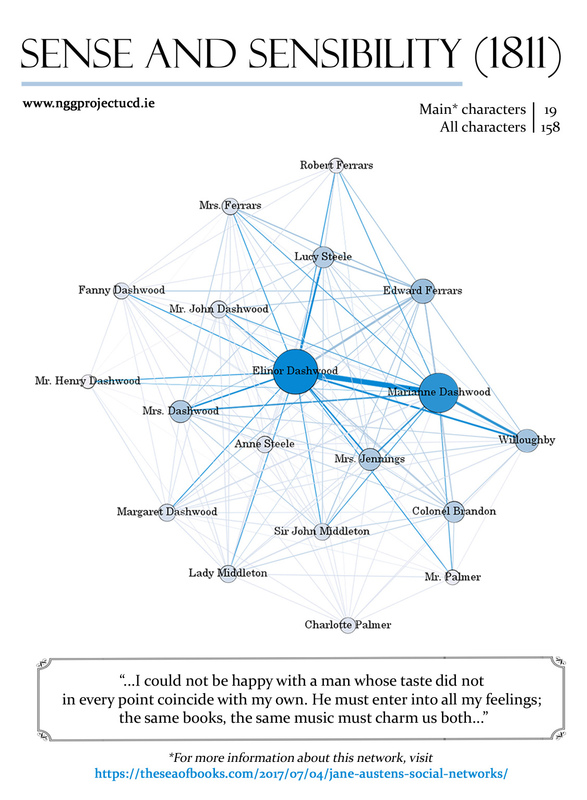 Each node on the network represents a character, and is sized and coloured to indicate the number of unique connections they have with other characters in the book – so, for example, Elizabeth Bennet is the biggest and darkest node on the Pride and Prejudice network, because she (as the protagonist) has the most connections with all other characters in the book. Meanwhile, the link (or “edge”) between any two nodes represents the strength of the relationship between those two individuals. The widest and darkest edge on the Sense and Sensibility network, for example, is between the Dashwood sisters, the novel’s two protagonists, in a striking (and unusual) example of a book which has at its core a relationship between two women. How did you determine which are the “main” characters? It’s remarkably difficult to determine which characters are the “main” ones in any given novel; one point that has been hammered home to us a number of times over the course of this project is that every character, no matter how seemingly insignificant, is there on the page for a reason. 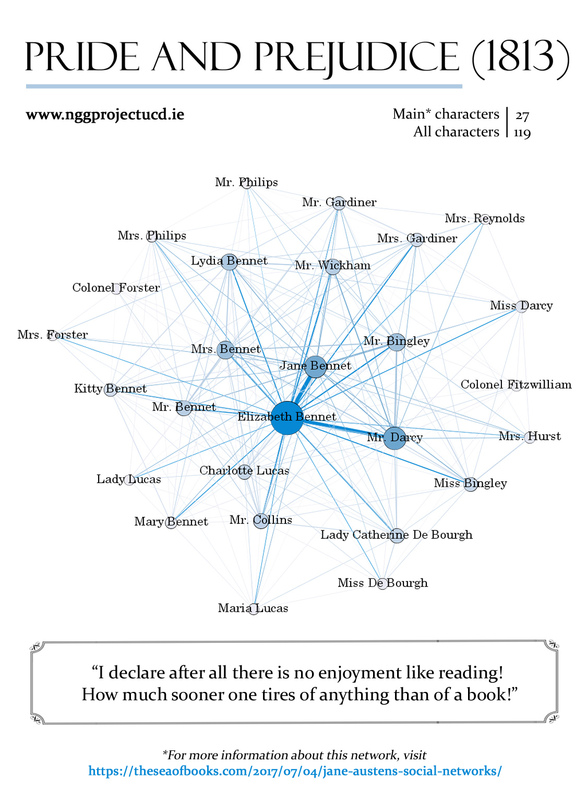 However, a network containing (for example) all of Mansfield Park‘s 218 characters would be fairly cluttered and difficult to read. 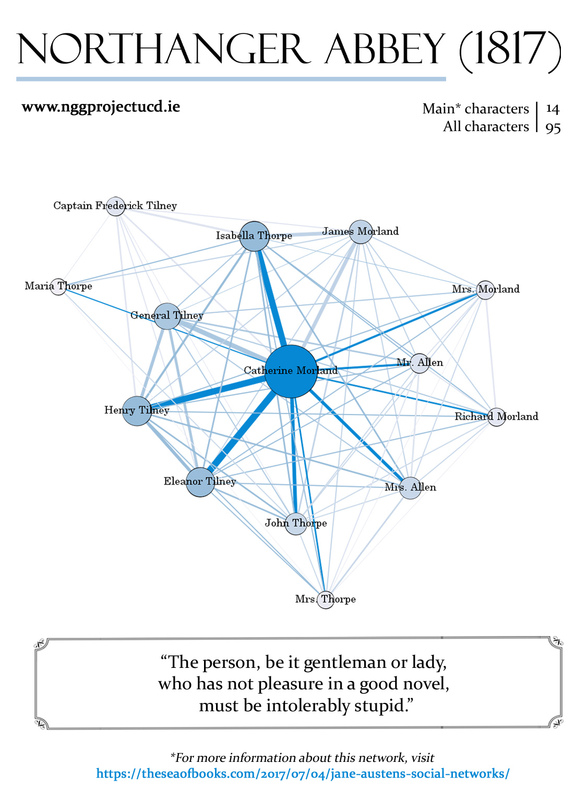 In order to make nice-looking network images, then, we solicited feedback from a group of Austen fans and scholars on which were the most important characters from each novel, and constructed networks showing just these individuals (although we erred on the side of including rather than excluding characters that seemed marginal). This method is a subjective one, of course, so we are open to feedback about who we should have included or left out! How many characters are there, exactly, and how did you count them? The definition of what constitutes a character is also a tricky one. I’ve discussed this in a bit more detail in this post, but essentially we decided to include anyone that appears or is mentioned, no matter how briefly. This means that our character counts tend to be a lot higher than those of similar projects. That quote you’ve used for the main poster; you know what that means, right? Oh yes! As it happens, this is one of our favourites. Jane Austen had strong feelings on the subject of novels, and her books often enjoy a bit of gentle mockery of characters who claim not to enjoy reading, or who only read “serious” works. This quote comes from Pride and Prejudice‘s Caroline Bingley, and is part of a wonderful character sketch in which books are a key component, revealing to us how much of a humbug Caroline actually is: she actually hates reading, but is pretending to enjoy it in the hope that Darcy will notice her. It’s a perfect example of Austen’s humour and subtlety of characterisation… even if it perhaps doesn’t mean exactly what it appears on the surface. Then again, if it’ll do for the Bank of England’s new £10 note, no doubt it’ll do for our poster as well! We hope you enjoy these visualisations! Previous Post Cat got your collar?